Excellent filming from Day 2 of the Flying Phantom fleet by Tiger Productions - Below press release sent by the Foiling Bay. Conditions were perfect on the first official day of racing with 15 races for all entries. With 14 boats having entered, the Flying Phantom races have been really intensive right up until the last leg. The Race Directors of each class have made the most of the sailing area by setting up short and technical races suitable for each craft, offering an outstanding show. spread out but everyone had someone else to compete with.” declared Anne Malledant, Flying Phantom Race Director, just after the racing. Thomas Zajac and Jason Saunders from Redbull were on fire all day long and still had hope to grab the top spot until they capsized in the 5th race. Despite this little stunt, the crew still finished second. 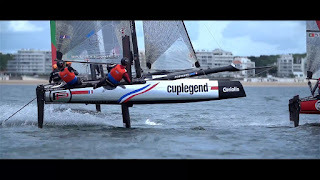 Cup Legend, skippered by Tim Mourniac and Pierre-Yves Durand finished first almost three times in a row. At the end of the day the scores are so tight that we can expect two days of highly contested racing. There were only six entries on the start line but what a race! Julien Villon, winner of the three races, didn’t give the others a chance. He handled his boat extremely well and almost overlapped the last boat twice. The starts were impressive with the fleet speeding like bullets at 15 knots going upwind while remaining really close to each other. It took only three minutes for the winner to reach the first buoy around one kilometre upwind. Downwind, they had to jibe at 20 knots, some managed to without even touching the water. The RS:X Convertible is a new class that we we should see on stage at the next Olympic Games. 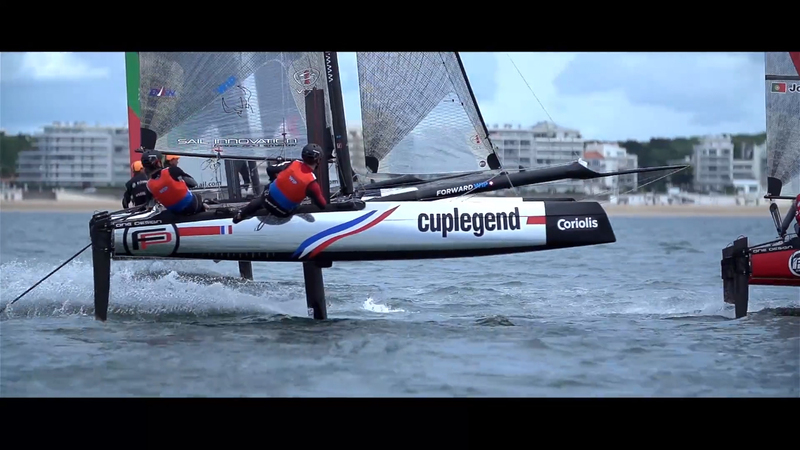 The goal is to modernise the actual RS:X by adapting it to have an attached foil, with an option to ride with a normal fin. The choice will depend on the weather conditions. Julien Bontemps, from La Baule, who won an olympic silver medal in London lead the fleet from the start to the finish of the race. The performance of the two girls in the race was admirable and resulted in Lucie Hervoche winning her first national windsurf championship. CR:X Kite Surfing is the same idea as windsurfing, with the aim to be in the Olympics. As in windsurfing, everyone has exactly the same kit so that they are racing on equal terms. In this way, it comes down to the sailors pure performance, tactics and strategy skills. Over the five races that were held, Kierian Le Borgne dominated leaving his rivals behind. In second place was Sébastien Cou, who despite being an excellent competitor had to content with watching his rival steam ahead.